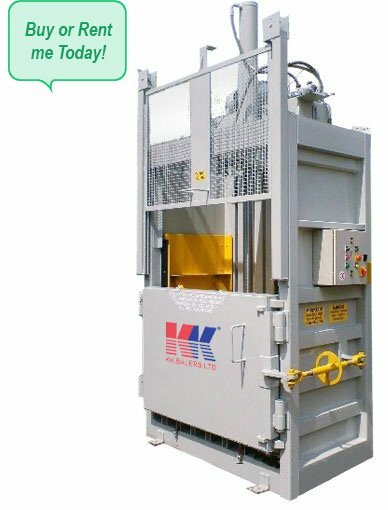 The KK 500 is our best selling machine and out performs any other vertical baling press of its kind. The powerful 42 ton press reduces all types of waste to a fraction of their original size in seconds. Card, plastics and other materials are compressed into dense mill size bales, of up to 600kg in weight. The wide feed aperture (1600 x 685 mm) simplifies and speeds up handling of bulky material, avoiding the need to break it down first, saving time and money. Storage, transportation and waste disposal costs are dramatically reduced. The mill-size balers produced in this baler, if not contaminated, will achieve a revenue stream, paying for itself over a period of time. The KK 500 Balemaster can be purchased or hired on a 5 year, 3 year and 12 month rolling and include maintenance. Please contact us for further details.